A couple weeks ago, I decided to take the 2 Weeks to Your Whitest Smile Challenge with Crest 3D White. I’ve gone through my box of the Luxe Supreme FlexFit Whitestrips, and I’m excited to show you my final results! I used the Whitestrips every day for 14 days, keeping them on for an hour as recommended. Since these stretch to fit anyone’s teeth, they’re comfortable to wear and grip nicely to stay put— which is important when you’re wearing them for a whole hour! There’s no real taste to them, either. After about fifteen minutes, I tend to forget they’re on except when I try to talk (they made me sound like I had a lisp). I typically wore them when I was doing homework or watching YouTube in the evenings. These are some of Crest’s most powerful whitening strips, and are supposed to deliver results as bright as a $500 professional teeth whitening from the dentist. With that said, it took a little bit of time to get used to the hydrogen peroxide level in the formula, which is known to cause a bit of discomfort with sensitive teeth. After the first application, I experienced what can only be described as pressure on my teeth. This is completely normal, though, and went away after a couple of days. Crest has different whitening products that cater to sensitive teeth, so you can pick what’s right for you. Although, I would say that small discomfort was worth it in the end. The proof is in the pudding, and after two weeks of wearing the Whitestrips, I can definitely see a difference in my smile. 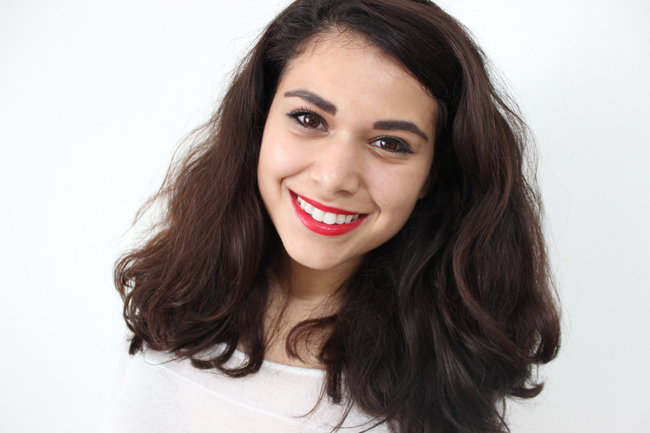 Wearing the same hot red lipstick, my teeth look about three shades whiter than they did before! I will admit I was a little skeptical, having used different whitening products in the past that left me wanting more. These actually performed and gave me a noticeably brighter smile in such a short amount of time. Considering how expensive a professional in-office whitening can be, these are a much more affordable option to getting a whiter smile. Plus, they’re convenient and you can whiten on your own time. I’m happy with my results, and will definitely be using these to maintain my bright smile every so often. 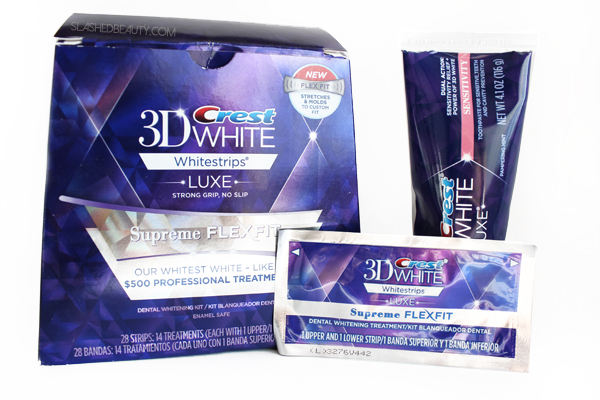 You can find the Crest 3D White Whitestrips Luxe Supreme FlexFit in drugstores, or at your local ULTA or Target. How have you tried to whiten your teeth? 2) Brush your teeth twice a day with Sensodyne, Colgate Sensitive, or Arm & Hammer Sensitive with Orajel. Use it for two weeks before you start your whitestrip course. They all contain potassium nitrate which helps coat and soothe the dentinal tubules in your teeth that send messages to the pulp chamber where the nerve is. Continue using it during your course (always brush 30-60 minutes before white strip application, never immediately before or after). Continue using it for about two weeks after the white strips course. This helps so much. Thanks for your insight, that’s some great advice! I can see a difference ! 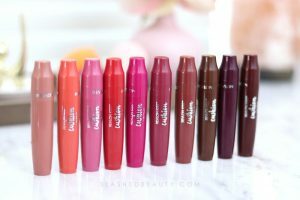 I have used them before and loved them. Wow, this did a really great job!! I can totally see the difference. That is awesome. Wow I can totally see a difference! Hey, I love your new hair! I also am very impressed by the difference in your smile. wow. I have been using Sensodyne for a while now, and I’m afraid to try any whiteners that may undo all my work (even using regular toothpaste ONCE can eliminate the effect of sensitive toothpaste) I wonder if I can use these with my sensitive teeth and not undo the effects of my toothpaste.. I would probably start out with the sensitive strip just in case. The pain can be pretty harsh depending on your teeth. I wouldn’t even say that I have necessarily sensitive teeth but definitely felt the level of peroxide in these. Thank you 😉 $2 shade from Jordana! 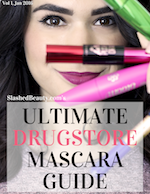 Wow – this is a great improvement! Your teeth look great! I get too much sensitivity with white strips unfortunately. Yes that is a common reaction! I’m not sure how well they work but they do have strips for sensitive teeth! Unfortunately, I have fake teeth on top and these don’t work on porcelain. 🙁 On the other hand, I’m glad that this is available OTC! Wow, that’s a great result, Miranda! I have used white strips in the past, but unfortunately, I can’t handle the discomfort for the entire time. Instead of getting used to it, it gets worse. I think I still have some White Strips under my sink, and if they aren’t dried out, I will try them again because they definitely do work! Yes I definitely had to power through the first couple strips, sometimes taking them off a few minutes early but thank goodness I built up tolerance. I love these strips. I was shocked that they actually hug the teeth super good and dont leave a yucky taste. You cant so see a difference too. Love it!! !